"I delight in creating kinetic sculpture machines which are novel, aesthetic, and unexpected, and which also can inspire, entertain, and demonstrate the power of engineering." 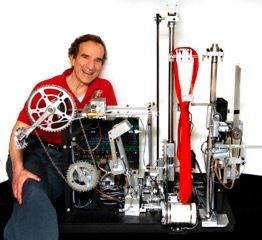 Seth Goldstein is a mechanical engineer who has been building instruments and machines for over 50 years. He was educated at MIT and spent most of his career practicing bioengineering at the National Institutes of Health where he was Chief of the Mechanical Engineering Section for almost two decades. 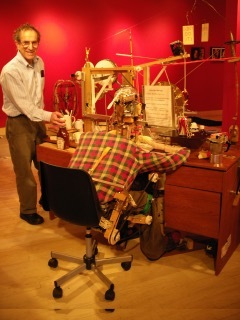 Since retiring from the NIH in 2002, he has applied his skills to creating kinetic sculpture machines. Outside interests include hiking, flyfishing, wilderness camping, and tree conservation. He currently is rigging a 6-foot long model of the clipper ship Cutty Sark, which he has built from scratch. 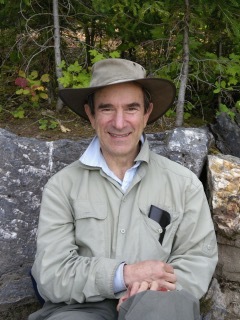 His work has been featured in articles by The New York Times and The Washington Post as well as in videos by CBS News. WHY KNOT? is a machine that continuously ties and unties a necktie. Computer control was provided by Randall Pursley. WHY KNOT? received world-wide press coverage in videos made by Reuters (distributed to 80 countries), Globo TV (Latin America), and the Voice of America as well as articles in The Washington Post and Philadelphia Inquirer. CRAM GUY portrays a life-size student “grundge-bot” seated at a desk who is frantically cramming for an exam and then slows down, collapses into a dream state, is awakened by a loud gong, and starts the cramming cycle over again. Computer control was provided by Randall Pursley. CRAM GUY is on display at the American Visionary Arts Museum in Baltimore. 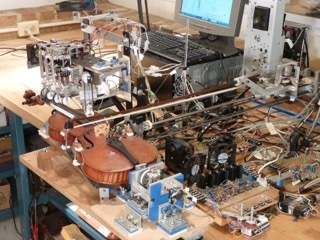 RO-BOW is a machine that plays a standard full-size violin. The horizontally orientated violin is rotated underneath a reciprocating violin bow while four mechanical fingers are moved to make contact, as appropriate, with the (highest) bowed string. Vibrato, pizzicato, legato, note-loudness modulation, and some other bowing effects are provided. When music is played on an electronic keyboard, a MIDI file is generated which is edited, and then used as the input to the violin computer. This computer generates numbers to control the electronics, powering the various motors to perform the prescribed motions which enable the violin to play the same notes as were originally played on the keyboard.